It's almost time! 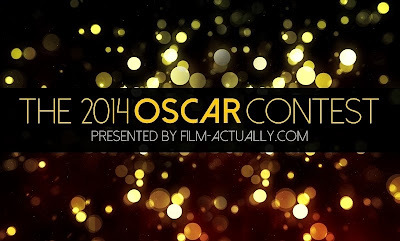 The Oscar nominations will be announced tomorrow and all the predictions are in for the 2014 Film Actually Oscar Contest. Thank you to all those participated and best of luck! Last year's winner managed to predict Jacki Weaver and the exact Best Picture lineup, so I hope you brought your A-game! Once the nominations have been announced, I'll start working on the spreadsheet and the official results should be posted by 2 PM US Eastern time.